This particular first aid kit is contained in a plastic casing with a gasket. It is mainly designed for commercial vehicles. Some of the key things included in the kit include antiseptic cleaning wipes, eye wash, tape roll, adhesive plastic bandages, cold compress, gauze roll bandage, burn relief packs, examination gloves, ibuprofen tablets, plastic tweezers, a triangular sling bandage, sterilized eye pads, nickel plated scissors, packs of antibiotic ointment, dressing pads, fingertip fabric bandages and an AMA guide booklet on first aid. 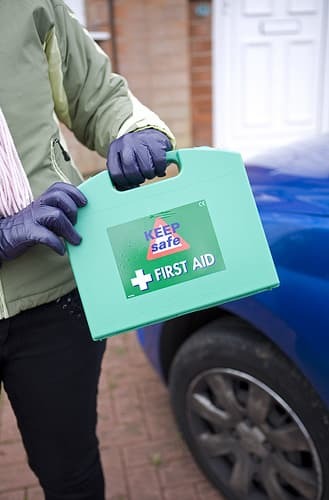 The AAA emergency road first aid kit is ideal for all types of vehicles for the supplies contained inside can be used in any emergency situation especially in protecting everyone in the vehicle against any danger. Some of the supplies contained in this automotive first aid kit include AA batteries, cable ties, safety vest, emergency poncho, assorted fuses, duct tape, flash light, cable ties, shop cloth, reusable zipper lock-bag, a two in one screw driver, booster cable, AAA emergency car care guide and membership brochure and, the rest of the usual first aid supplies. The first aid supplies in this automotive first aid kit are contained in a large plastic case in preparedness for any emergencies that mat occur on the road. The kit is designed to save on both time and frustrations that are quite an issue whenever emergencies on the road occur. The supplies contained in the case include non-aspirin, motion sickness and ibuprofen tablets; antiseptic, insect sting relief and alcohol cleaning pads, emergency blanket, finger splint, tape roll; fabric, gauze roll and plastic bandages, dressing pads, vinyl gloves, safety pins; cream packs, 911 call banner and a first aid guide among others.